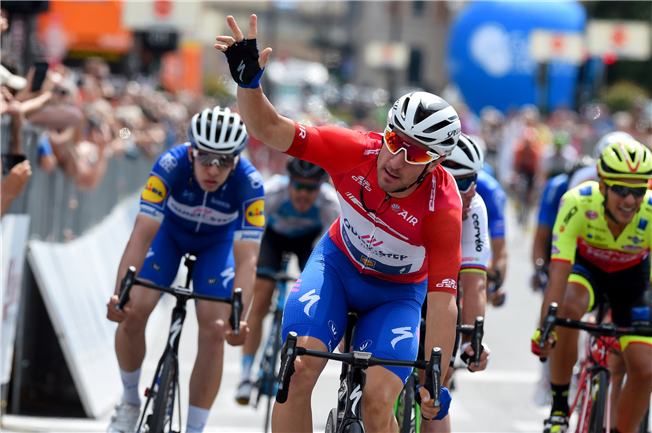 24-Jun-2018: Elia Viviani continued to enjoy an absolutely sparkling run in the Quick-Step Floors jersey, this time in the charming Trieste, where the inaugural edition of Adriatica Ionica concluded. First rider to don the leader’s jersey at the five-day event, the 29-year-old didn’t have any rival in the three stages which culminated in a bunch sprint, taking as many convincing wins and cementing his place at the top of the individual victories standings. The circuit in Trieste, which the peloton covered six times, was the one used on the last stage of the 2014 Giro d’Italia, with the start and finish reversed, and Quick-Step Floors policed the front of the bunch, chasing down the escapees and setting up the sprint for Elia Viviani, whose burst of speed sent him across the line arms aloft, ahead of Mark Cavendish (Dimension Data) and Riccardo Minali (Astana). “This was my first stage race since the Giro d’Italia and I come out of it happy with my sprint, the number of victories and confident for next week’s Italian Championships, my last appointment before a well-deserved break”, said Viviani after his 13th win of the season.